Over the holidays my wife Claudia and I drove down to New Mexico for some desert time and to escape winter for a while. 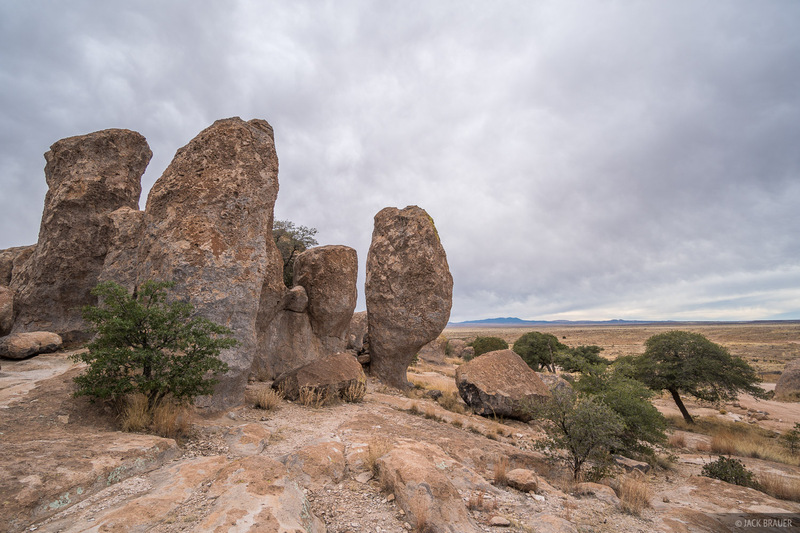 We spent a few days in Santa Fe, camped in the White Sand dunes, hiked in the Organ Mountains, explored the City of Rocks, and I even got to skate the famous ditches of Albuquerque! Christmas Eve in Santa Fe. 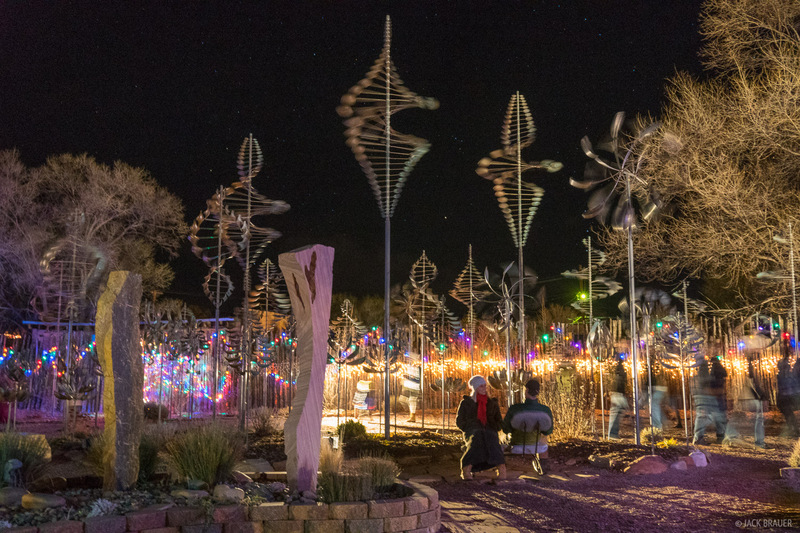 We spent Christmas in Santa Fe, wandering around enjoying the lights, luminaria, galleries, and especially the food! For a green chili lover like me, New Mexico is the place to be! But the highlight for me was the Violet Crown Cinema, which has dozens of beers on tap and a real dinner menu. Why aren’t all movie theaters like this? (We saw Arrival, which was awesome). 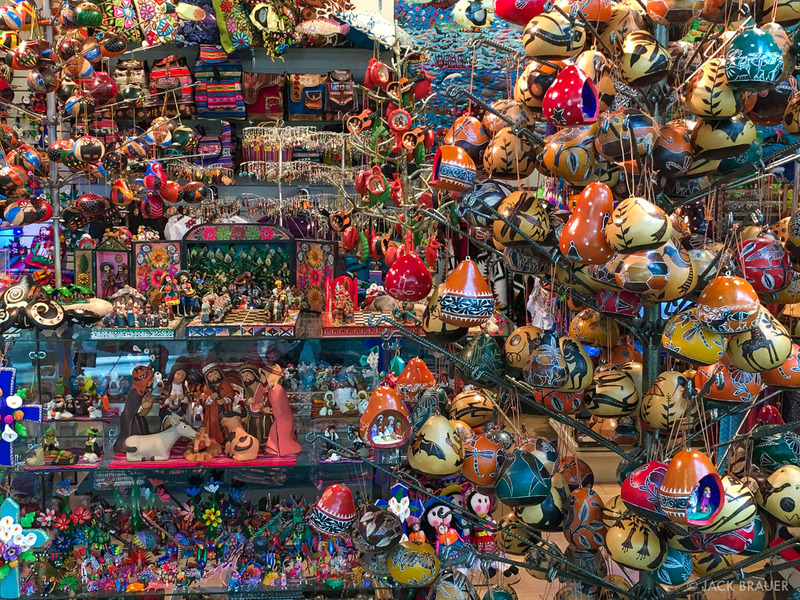 Colorful gift shop merchandise in Santa Fe. 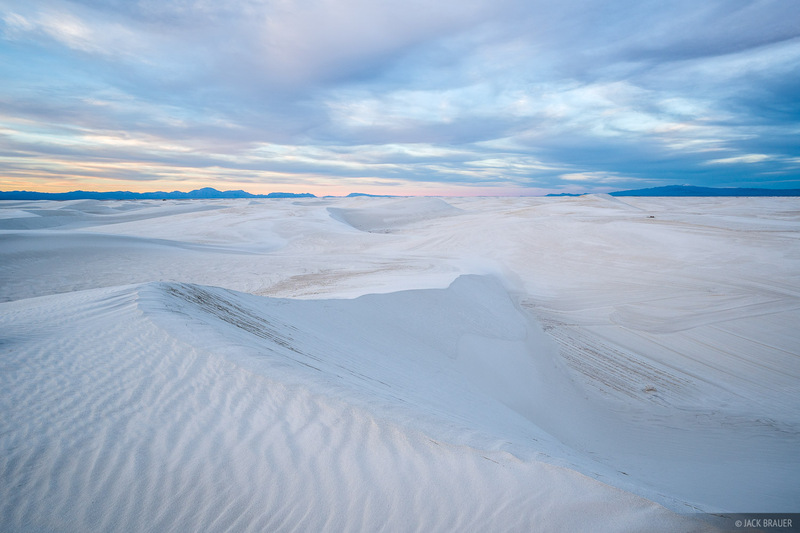 After a few days of relaxing in Santa Fe, we hit the road and headed south to the White Sands National Monument, a place I’ve wanted to visit for many years. 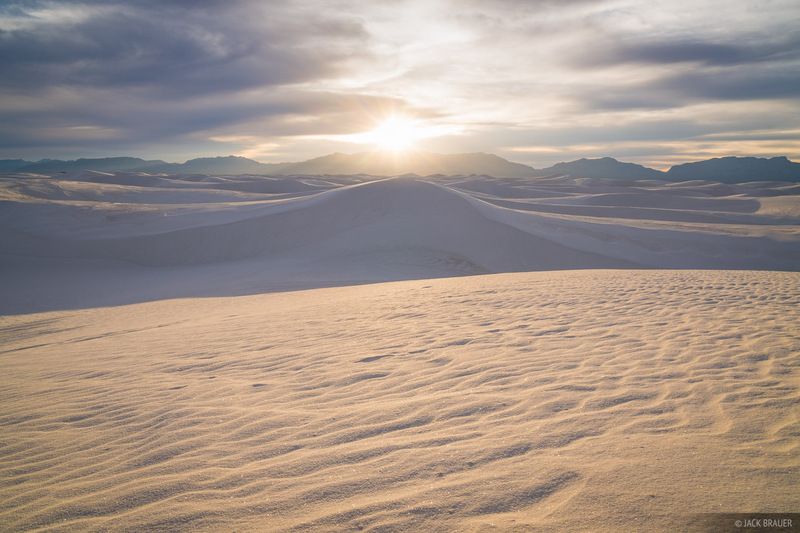 The White Sands are the worlds largest gypsum dunefield, covering 275 square miles of desert. The sand is almost pure white with a soft powdery texture. 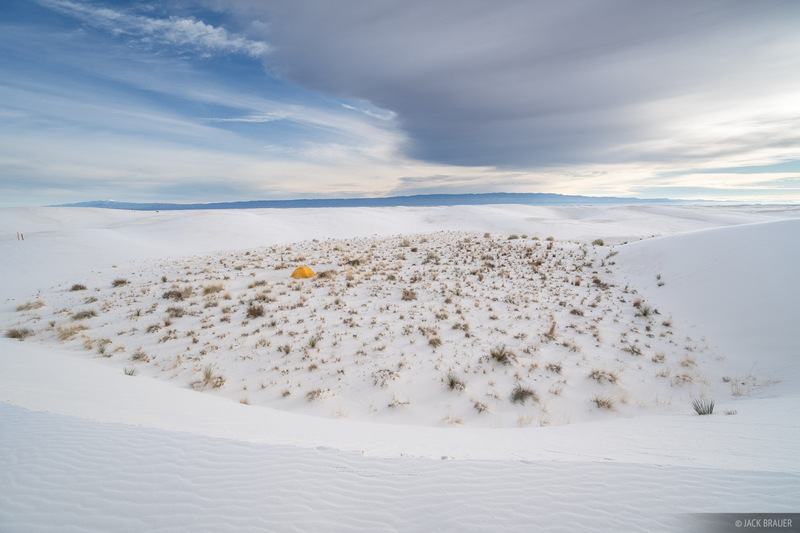 Campsite in the White Sand dunes, December. We backpacked out into the dunes and camped at one of the designated backcountry camp spots. The campsites aren’t very far from the road so after setting up our tent, we walked an hour west towards the pure heart of the dunes to watch the sunset. Sunset in the White Sands dunes, December. 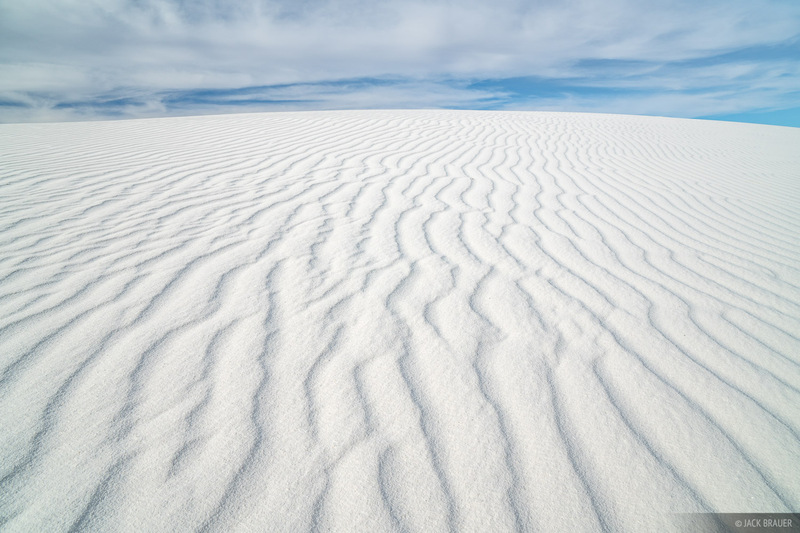 The pure white sand almost looks like snow, and reflects the light of the sky beautifully in every tone and color. Dusk light in the White Sands dunes, December. Though it was comfortably warm during the day, at night it got surprisingly cold in our tent. I think the reason for that is because the sand is actually quite damp under the surface, and the moisture made the air feel colder than it really was. 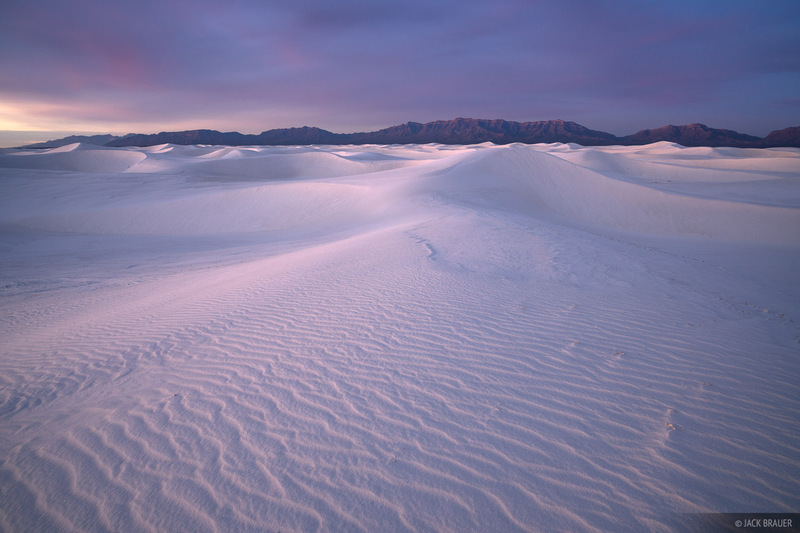 Dawn light illuminates the White Sands dunes, December. 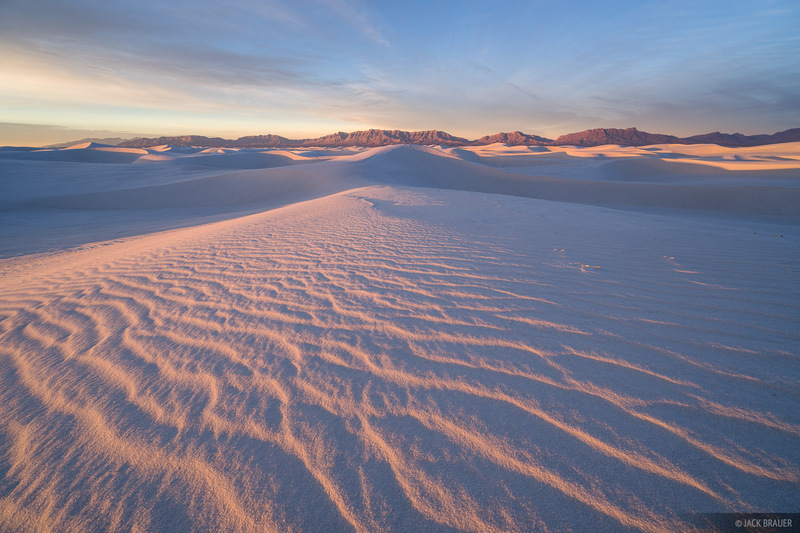 Sunrise light in the White Sands dunes, December. 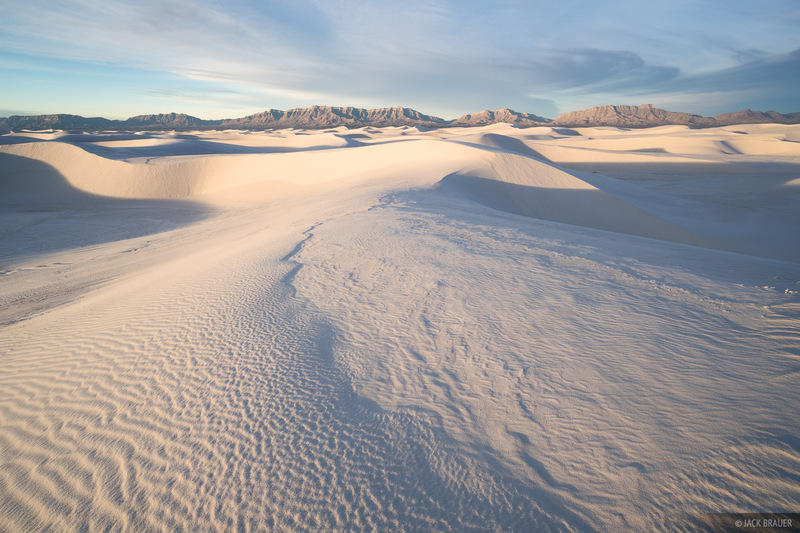 Morning light in the White Sands dunes, December. We woke up early and watched the sunrise, sipped our coffees, and laid around in the sand and sun for a few hours before packing up the tent and heading back to the truck. 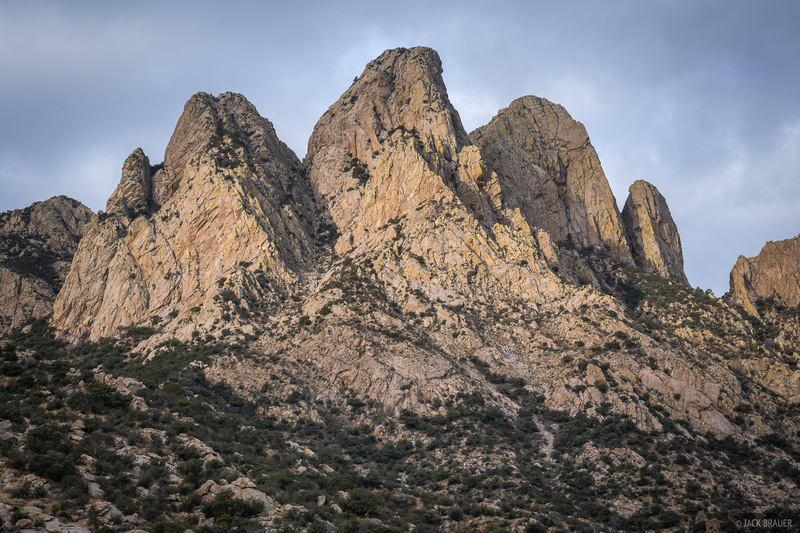 Next we drove to the nearby Organ Mountains where we did a nice loop hike and camped at the Aguirre Springs Campground. I must admit it felt great to hike on a dry mountain trail in the heart of winter! Sunrise light on the Rabbit Ears as seen from the Aguirre Spring Campground, December. 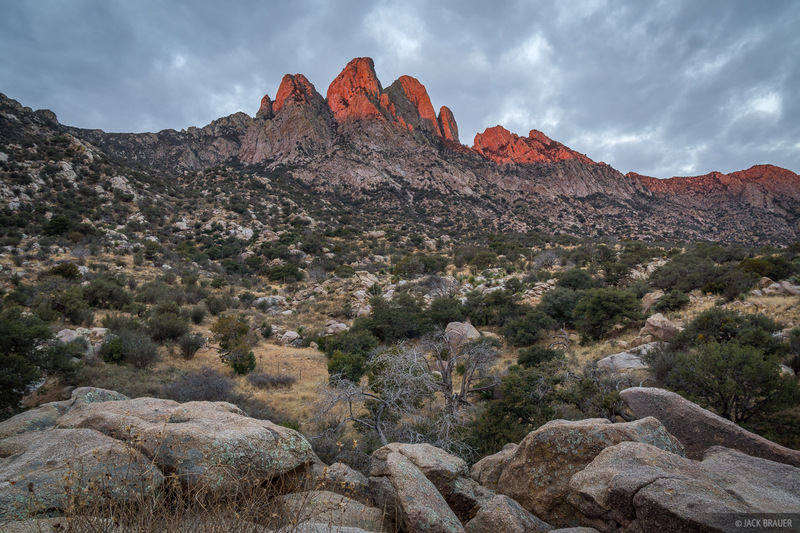 The Organ Mountains are a small but impressively rugged mountain range, part of the Organ Mountains-Desert Peaks National Monument established in May 2014 by President Obama. I can imagine spending more time hiking around here in the future! 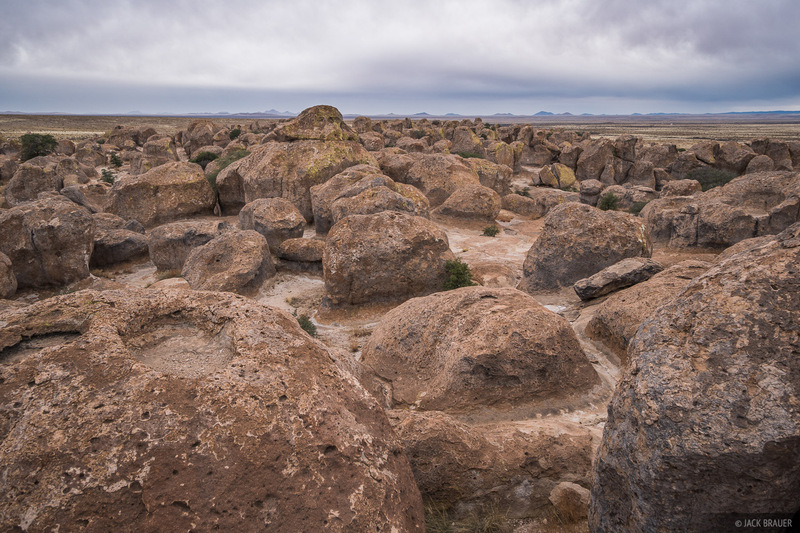 Next up was the City of Rocks State Park, an interesting spot where a cluster of oddly shaped boulders pops out seemingly randomly from the flat desert surroundings. We had a fun time scrambling over the rocks and exploring all the little nooks and crannies between them. Indeed the place does seem like it would be a perfect little town for cavemen or outlaws! What’s also cool about this state park is how they put campsites in all these neat spots right up in the edge of the boulders. After a week on the road our time was running out and colder weather was rolling in so it was time to head home to Colorado. But first there was one more thing I hoped to do. Ever since I was a little skateboarder kid I had heard about these skateable drainage ditches in Albuquerque with perfect angles and transitions, like concrete waves that extend for miles. The pictures I’ve seen looked amazing and although I haven’t really skateboarded much at all in the last decade, it’s still been a kind of bucket list dream of mine to skate those ditches one day. So before we left I threw my longboard in the truck in hopes that maybe the ditches were dry and clean enough to skate in December. And they were! Apparently there are dozens of skateable ditches in Albuquerque, but I headed straight towards the most famous one – the Indian School Ditch, a perfectly angled ditch with smooth transitions that provides a dreamy mile-and-a-half ride. Mellow enough for a rusty ex-skater like me! I rode it three times before sunset, and Claudia was kind enough to shuttle me back to the top each time, and she even took these shots of me on my way down. Of course I had to GoPro it; below is the footage from my last run at sunset. Most people will probably get nauseous watching this video, though I find it distinctly relaxing! This trip was only my second time in New Mexico (we went to Taos a few years back) and it was an eye-opener to see how much there is to see and do down there! I’m sure this won’t be our last New Mexican winter getaway! Posted in Canyons & Deserts and tagged New Mexico.